So here’s the thing. I went to our local farmers market last weekend – the first time it’s been warm enough to go – and scored some totally awesome finds. Awesome for Wichita, that is. You see, I used to live in Portland, Oregon, where farmers markets took up entire college campuses and housed hundreds of vendors, 5 of which sold nothing but strawberries. I had choices people, I had options. I was in produce heaven. In Kansas, we’re in the heart of the Midwest where farming is supposed to be our gig, but for some reason farmers markets aren’t as abundant. It’s typically more of a picked-over tomato and homemade knickknack type of scene. To score some amazing looking carrots or fresh herbs or gorgeous heaps of kale is rare. Our markets simply don’t compare to coastal contenders. But, but, at the recommendation of local friends I went to a market on the west side of town that boasted some of the freshest and biggest variety of produce I’ve ever seen in Kansas. I was so pleasantly surprised that I swiped up nearly $20 worth of organic goods and I’ve dedicated two entire recipes to my finds! The first of which being this hippie-looking breakfast roll-up I’ve been digging that was originally inspired by my lovely friend Aubrey. While on my Conscious Cleanse, gluten was out of the picture, so I turned to green alternatives instead. At the market I scored some amazingly gorgeous rainbow swiss chard from the sweetest mother and daughter – along with a handful of kale – and immediately went home to make a hearty yet clean breakfast roll-up. The concept is simple. 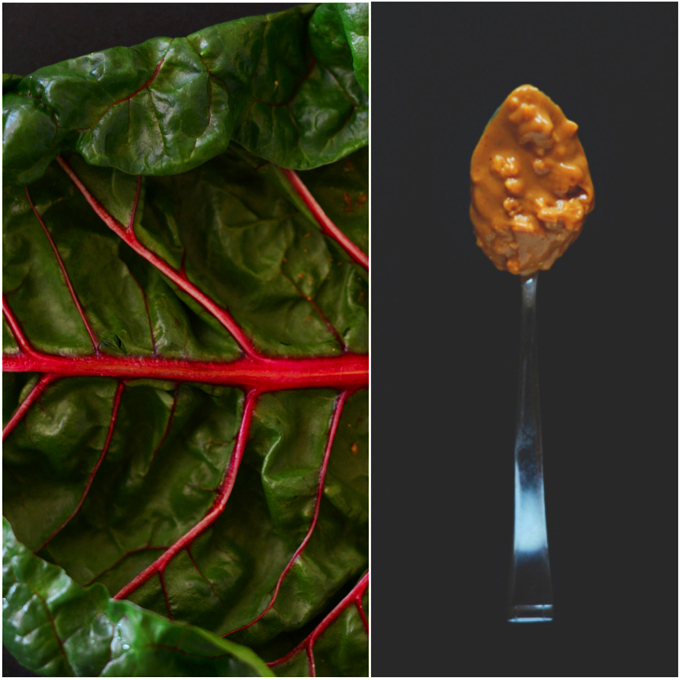 Simply rinse and dry a large leaf of rainbow chard, carve the vein down a bit if it’s too thick (or remove it altogether), slather on a nut butter – I went with salty natural peanut butter – top it with other additions, such as flax, basil and a banana, and roll the whole thing up! I call it breakfast, my co-workers call it “that weird thing I was eating.” I’m convinced they’re the ones missing out. You know I’ve loved the flavors of peanut butter and basil for a while now, and this wrap takes it to a whole new level. 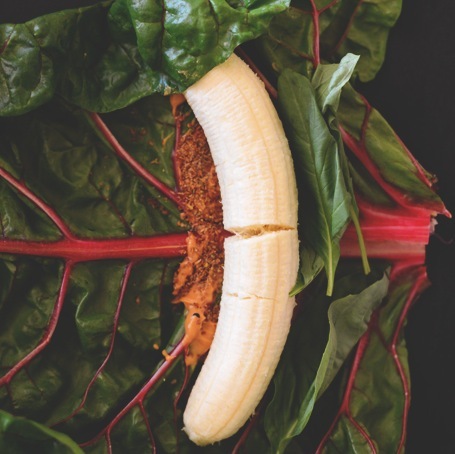 The rainbow chard is slightly sweet and crisp, the peanut butter-banana meld together like a dream, the flax adds a bit of earthiness and the basil gives it a distinct almost minty flavor. I could eat this wrap over a stack of pancakes all day long. Don’t get me wrong, pancakes are great. But sometimes a girl just needs her greens. 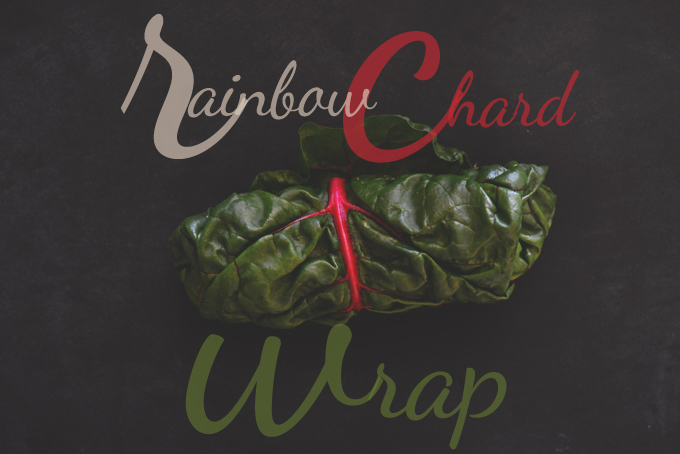 Rainbow chard topped with peanut butter, banana, flaxseed, and basil and rolled up into a portable breakfast, lunch, or snack wrap. So green, so good. 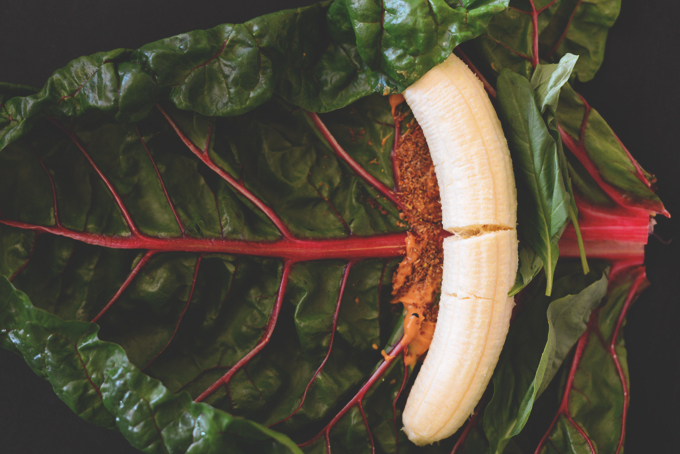 Flatten your rainbow chard and, with a knife, shave the stem down so it’s easier to roll up. Alternatively, cut out the bottom portion that tends to be more rigid. Starting at the bottom about 1/4 of the way up (see photos) smear on peanut butter, add flaxseed, banana and basil and roll the whole thing up like a regular wrap, tucking the sides in as you near the top. If your banana isn’t ripe/sweet enough, add a drizzle of honey or agave to sweeten. Secure with a tooth pick and cut in half. Or, simply grasp in your hands and enjoy immediately! I ate half at breakfast and carried the other half in a baggy for a snack later on. It was just as delicious a few hours later. Five years late on this, but it’s this wrap is life changing! didn’t have any chard but had some collard greens that i’m try to use up. enjoyed it. would have never thought of putting the combination together. I just had that. Used sweetheart cabbage because that’s what I found in the supermarket and forgot the basil. WHERE has this thing been my whole life? This is breakfast from now on. If your obviously superior culinary creativity comes up with other ways of filling the wrap, please share. Please. This is such a great recipe! I am very happy I found this blog. My boyfriend and I started one, EandTripleT, a little while back ago just for fun….and now I am seeing so many new opportunities. Fun site! Love the design and concept. Keep it up! Thanks Dana! I appreciate that. Would you be willing to mention us in one of your posts? We would definitely do the same – although, we don’t get as much traction as you guys do (Yet :)). Hey, I just found your blog and was pretty excited when I discovered that you live in Wichita. I grew up in Gardner, Ks, also spending a great deal of time in Topeka where my dad lives. I moved to Seattle last September for my freshman year of college, but am spending this summer in Manhattan, living with my sister. Anyway, your blog is great and I look forward to digging through the archives. So cool! Many readers are surprised to find out we’re in Wichita. it’s always a pleasant surprise to hear from fellow mid-westerners. Good luck in Seattle! Great city – we kind of love it there. I am so intrigued by this, Dana. 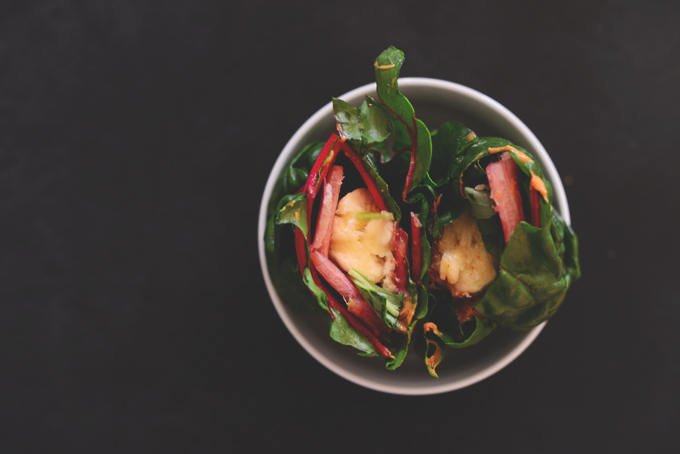 I’m all about eating veggies (especially the green ones) at any time of day and I make savoury green wraps regularly, but I have never thought to do a sweet version. I’m totally going to give this a try. P.S. I haven’t commented before (not sure why! ), but I adore your blog! you are so sweet! Glad you said hi. Always love hearing from readers! This is life-changing. My go-to breakfast on busy mornings is whole wheat toast with peanut butter, flax, a banana and walnuts. LOVE the idea of starting the day with greens instead of bread. I would never have thought of this, it’s pure genius. Thank you! This is SO gorgeous. Love the simplicity, the healthfulness, the ingredients, everything! This confuses my peanut butter lovin brain. And banana lovin brain. And greens lovin brain. And spaghetti (basil) lovin brain. Love that your coworkers call it “that weird thing you’re eating”! That has so happened to me a million times…. I’m intrigued! I saw your pb and basil post the other day and was thinking it was crazy, now I’m thinking ill actually try this combo out. ahh this is so cool! Awesome idea for a fast breakfast. What an interesting combination, theoretically in my mind should be a perfect one.. I just need to taste it. Thanks for the idea! 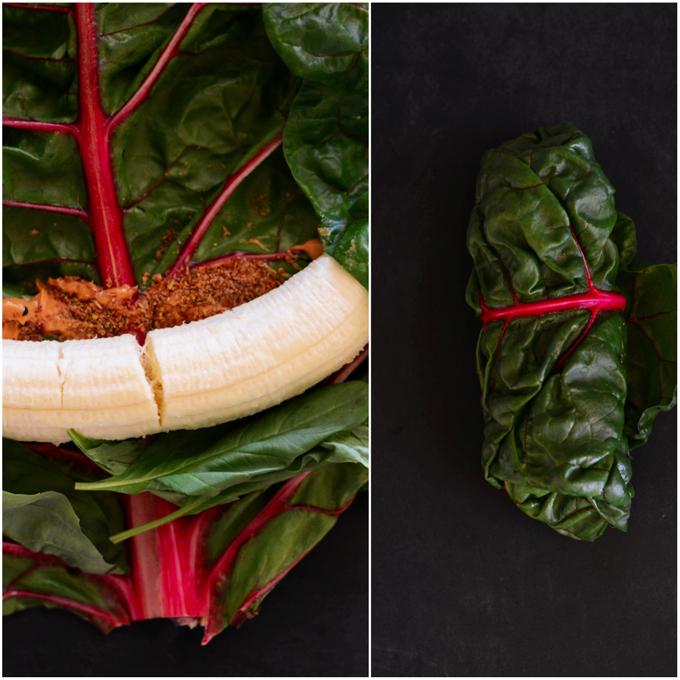 Also I need to taste/test banana/basil pairing. I just discovered your both sites and love it. Awesome pictures too! I live in Wichita and would love to hear more details about this farmer’s market. Clara, it’s the one at 21st and Ridge! Go check it out. Runs through October, every Saturday from 7-noon. Great produce and lovely people! Thanks Natasha! I don’t know what the deal is with produce in Kansas. Weird, huh? In any case, glad to hear from a fellow Kansan. Cheers! Oh how easy it that?! Definitely trying that out. YUM! It looks so cute! But it’s not too bitter with the raw rainbow chard? nope! the rainbow chard I got was actually not bitter at all – it was sweet even! So simple and awesome!! Totally trying this asap! In LOVE with this! So simple, so healthy and so good!